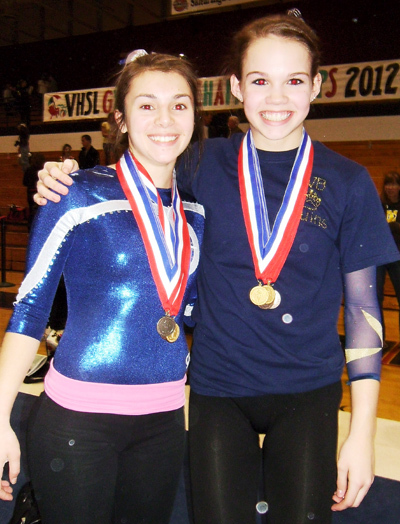 At the state gymnastics meet over the weekend at Salem High School, one new star shined across the Old Dominion. Another, hidden for far too long, finally got to show its own luminosity. 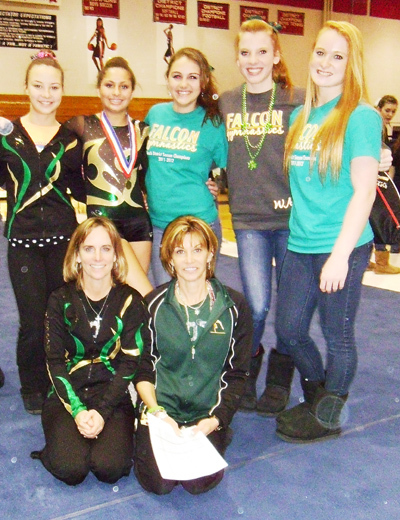 After over 30 years of coaching, all but two of which have been spent at Cox, Melody Hartranft had seen one competitor after another stand above her squad on the team stand. Six times, the Lady Falcons had been right next to them in second place, but Hartranft, herself a Cox alumnus, had never made it to the top. Jamie Stone, on the other hand, was knew to this sort of thing. In her freshman year at Western Branch, Stone was a week off of taking third in overall individual competition, and hoped to end her debut Virginia year with a strong setting. But as both team and singular competition kicked off, an obstacle sprung up in singular and team competition: the same ominous vault that's intimidated generations of gymnasts. Stone's 9.825 score left her at third place. The Cox girls, on the other hand, stumbled hard; none of the five Lady Falcons managed even a nine, leaving them in seventh place out of eight teams one event in. Still, Hartranft had been here before, and quite recently; her team got off to a rough start in district competition a few weeks ago, only to come back and take the Beach title. "I just told (my team), 'You can do it, and don't give up,'" she said. "It was in their hands." They responded, with four girls scoring at least 9.1 on the uneven bars and the highest team score in the event. They didn't slow down on the beam, racking up another team high score. Back in the individual games, Washington-Lee's Mary Lynn Clark was off like a rocket, scoring 9.9 in both the vault and bars, the first two 9.9 scores of her career. "The last two times I tried the vault, I fell," Clark said. "Honestly, I got lucky. My bar routine is always like that, but it was cleaner today than usual. It was just on." Jenine Hutt gave the local crowd a special reason to cheer, as the Salem senior notched the second state balance beam title of her career with a 9.825. "I've always been confident on the beam," she said. "I just do what I do, and don't worry about the score. I worry about staying on the beam and staying confident. I was shaky, since it was my last meet." With one event left, the individual title was still up for grabs. Even ahead in the team games, Cox's girls were ready to hit the floor - hard. As Hartranft started to feel the state title coming into her grasp, three of her girls racked up scores above 9.3. Then Meredith Fiskus went out and came back with a 9.7 score, putting Cox at 148.075 points for the event, nearly two full points higher than anyone else. Hartranft and her girls had finally snared the title. "I was thinking about this banner the whole time," Hartranft said, clutching the championship placard. "We have a lot of talent on our team, and I did a lot of praying. It was a dream come true." As one girl after another finished up her respective floor routine, the scores rose along with them; the last seven competitors either equal or improved on their predecessors' marks. After watching Great Bridge's Courtney Adams, who tied with Cox's Elizabeth Mancini for the all-around Eastern Region title, finish with a 9.725, Stone would be the finale. And she made it grand - her floor routine racked up a 9.75 for her first individual crown of the night. "If I look at the scores, it makes me nervous," she said. "I blocked everything out and went out there and did what I could." Finally, it was time for the final all-around ranks. Mancini and Adams were fifth and fourth, with Freedom's Arianna Robinson getting third. With a 38.65, Clark got the silver medal. One bad fall, one stepped step, a landing a few degrees off... any other them could have meant the difference for Stone. But just at the right time, they stayed away: with a final of 38.875, she got a freshman's dream ending. "I was in shock," she said. "I haven't gotten first all year. I was just out there having fun. I didn't start off that good, but I did OK. I'm excited."